From the ‘school’ of Tony Macalpine, Vinnie Moore and Joe Satriani comes this guitar-oriented tour de force. The axeman is Simone Fiorletta, who runs a parallel career with Italian Progressive Metal band Moonlight Comedy. 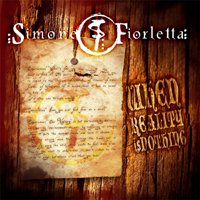 “When Reality…” is already Simone’s 3rd solo outing. Emotionally intense as much as it is technically refined, the album celebrates not only the guitar as a source of expression but proposes intelligent instrumental compositions that are in reality easily accessible. Taking, for example, the hard-rocking riffs ‘n’ hot licks of ‘Dance In The Cit’ and comparing it to the sensibilities of ‘Loneliness In Your Eyes’, you realise that that this is quite a versatile album. Simone has a great set of musicians with him, which include some of his mates from Moonlight Comedy. Other guests have joined the ride, such as Andrea DePaoli – keyboardist of one of Italy’s premier Power Prog bands: Labyrinth, who here seems to know when to be indulgent and when to take a back seat. Mistheria (Bruce Dickinson, Angel Of Eden) is another keyboardist that contributes to the album as does Marco Aiello on drums, bassist Matteo Raggi and guitarist extraordinaire Neil Zaza, who playing one guitar solo on this album. Apparently the song-titles have personal meaning for Simone….not that it should make any difference for the listener. When the music is instrumental, each listener instinctively constructs his own imagined stories. Despite being a very good album, “When Reality…” sounds unpretentious in its ambitions. It just wants to be – and succeeds in being - a well-executed and enjoyable album. 7. Oh No, Once Again? !